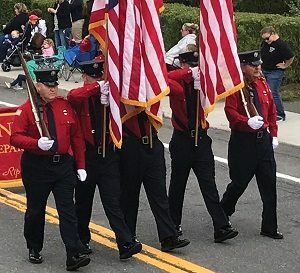 Pictured far right, Ed Synan was able to march in his community parade thanks to his remarkable rehabilitation following a spinal cord injury. When 69-year-old Ed Synan of Palenville, New York, went on vacation to the New Jersey Shore in August 2016, a fun-filled day at the beach turned into a family nightmare. While bodysurfing with his kids and grandchildren, Synan suffered a life-threatening spinal cord injury when the waves pushed his head into the sand. He remembers nothing of his rescue on the beach or the lifeguards who performed CPR, but he does remember waking up about 45 minutes later in the ambulance on his way to the nearest hospital. Once stabilized, Synan was transferred to Jersey Shore University Medical Center where he spent about a week before being discharged to a rehabilitation facility in northern New Jersey. In time, he was able to move his legs and arms, and with the help of physical and occupational therapists, he started to regain his independence. During his month of inpatient rehabilitation, he worked on walking, going up and down stairs, feeding and dressing himself, and other activities of daily living. But, it was apparent that although he was ready to go home, he would need specialized outpatient therapy. Sunnyview physical therapist Mary Lamp remembers that Synan’s motivation, good information from the referring facility, and a supportive family all contributed to his success. Today, Synan is back to his old self: driving, walking several miles each day, playing golf, doing yard work, volunteering with his good friends at the Palenville Fire Department, and enjoying his seven grandchildren. For more information about Sunnyview hospital, please click here.